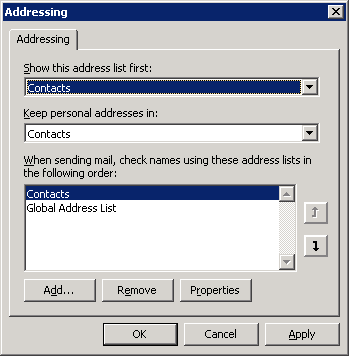 When Microsoft Outlook is connected to a Microsoft Exchange Server the default list of addresses list displayed by the Outlook Address Book will refer to the Global Address List in exchange for your organisation. In most cases you will want to change this option so that by default your Microsoft Outlook Contacts will be displayed whenever you are selecting recipients for an email. 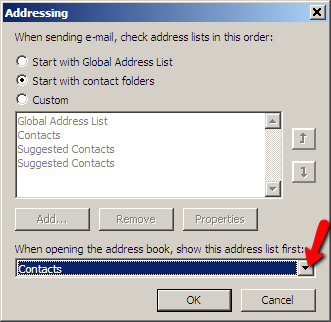 The instructions below explain how to change your Address Book Options in either Microsoft Outlook 2007 or Microsoft Outlook 2010. 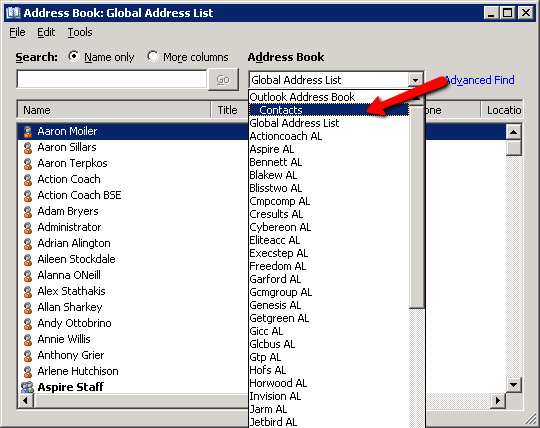 If you have Microsoft Outlook 2007, click the Address Book icon from the toolbox as shown below. 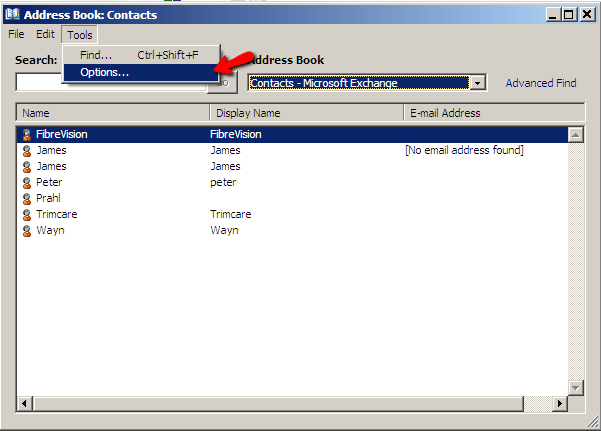 Click the drop down list on the right and select Contacts listed under Outlook Address Book. 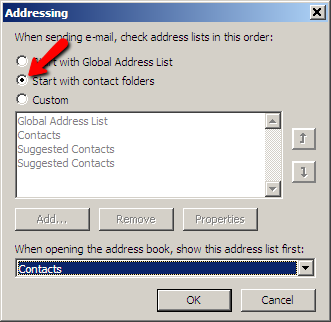 To ensure Outlook will open your contacts every time you use the address book, Click the Tools from the Address Book Dialog menu and select Options. 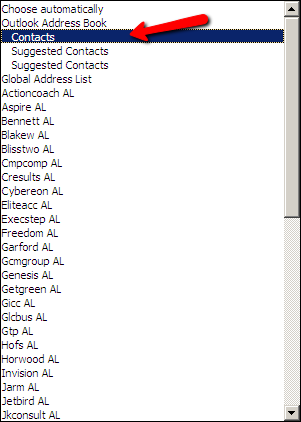 Select Contacts from the list of available options in the Show this address list first drop down list. Then in the middle box move the Contacts option in the list of options to the very top of the box using the up arrow as shown below. 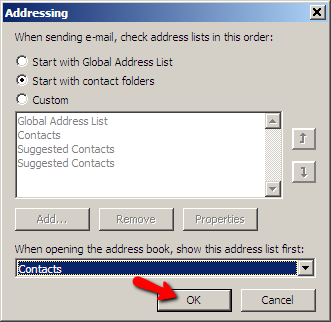 Click OK to save your new Microsoft Outlook address book default options. You have now successfully updated your Outlook Address book to show your Outlook Contacts Folder by default each time you choose recipients to send an email. If you have Microsoft Outlook 2010, click the Address Book button located on the toolbar on the Home tab. 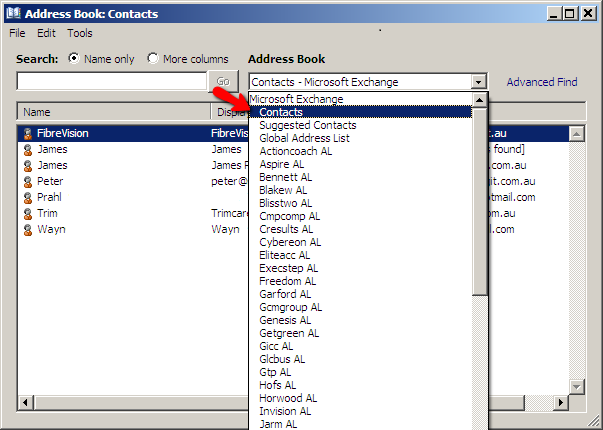 Click the drop down list on the right and select Contacts which should be directly below Microsoft Exchange. At the top Click the Start with contact folders option as shown. At the bottom of the options dialog expand the drop down list in relation to choosing an address list to show first. 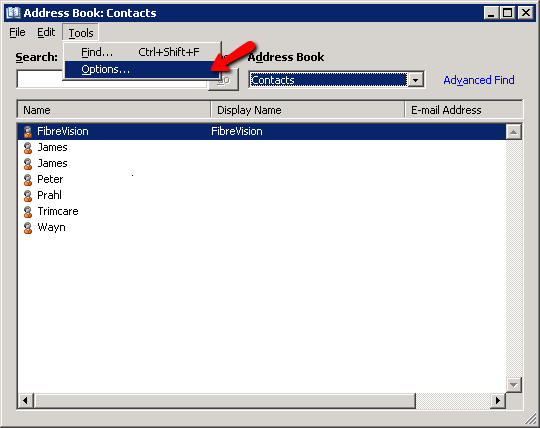 From the list, select the Contacts option which is located under Outlook Address Book. You may need to scroll up to find this option.